A meteorite that exploded as a fireball over California’s Sierra foothills this past spring was among the fastest, rarest meteorites known to have hit the Earth, and it traveled a highly eccentric orbital route to get here. An international team of scientists presents these and other findings in a study published Friday, Dec. 21, in the journal Science. The 70-member team included nine researchers from UC Davis, along with scientists from the SETI Institute, NASA and other institutions. 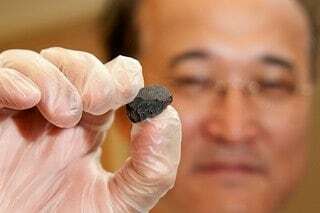 The researchers found that the meteorite that fell over Northern California on April 22 was the rarest type known to have hit the Earth — a carbonaceous chondrite. It is composed of cosmic dust and presolar materials that helped form the planets of the solar system. Meteorites like Sutter’s Mill are thought to have delivered oceans of water to the Earth early in its history. Using neutron-computed tomography, UC Davis researchers helped identify where hydrogen, and therefore water-rich fragments, resides in the meteorite without breaking it open.